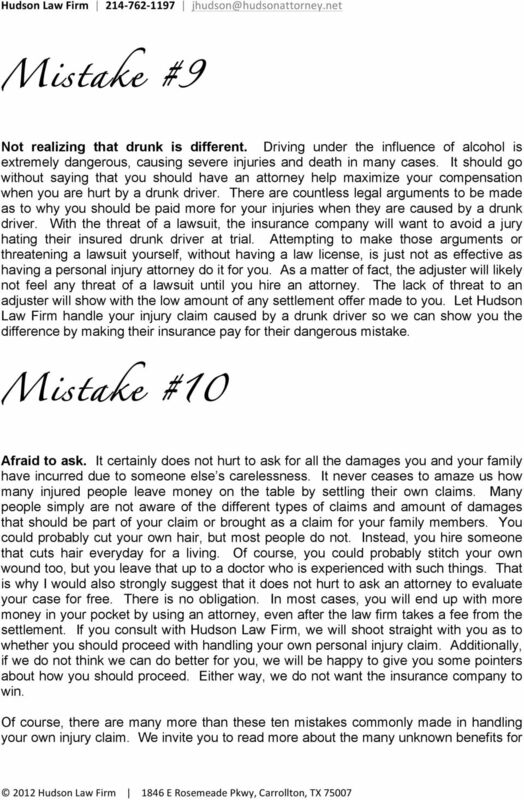 Download "TOP 10 MOST COMMON MISTAKES MADE IN HANDLING YOUR OWN INJURY CLAIM"
2 Mistake #1 Giving a statement. While I recommend that you always have an attorney present for a statement, I know that many times a statement has already been provided before you have had a chance to call an attorney. If you are going to handle your own insurance claim, it is almost impossible to avoid giving a statement. The insurance adjuster will demand that you provide a recorded statement about the accident and your injuries. Make no mistake about it -- the only purpose for the insurance adjuster to take your statement is to possibly get evidence to use against you in your claim. Do not expect the insurance adjuster to fall in love with you or want to offer you more money after you provide a statement. Mistake #2 Giving a statement too early. I cannot tell you how many times one of our clients admitted in their statement that they were not hurt, only to later feel pain and find out they were injured a great deal. Even an immediate visit to the emergency room will not necessarily uncover some injuries only felt or discovered much later. Keep in mind that there is no way for you to know how to summarize all of your injuries, pain, or the amount of your damages until you are done treating with a doctor. Unfortunately, most of the time, a statement is provided immediately after the accident, while your adrenaline is still pumping, before you realize that you are hurt, or before you have seen a doctor yet. Many of our clients that end up needing extensive medical treatment, including surgery sometimes, did not feel much pain until waking up the next morning and realizing they could hardly move. 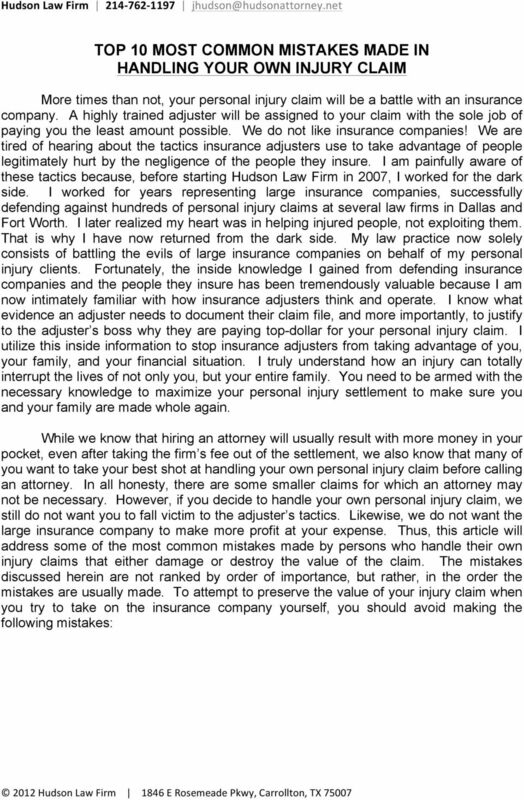 Now you see why insurance adjusters want to take your statement and take it as soon as possible to get you to admit on record that you are not hurt or not feeling much pain. We recommend our clients never talk to an insurance adjuster, but rather, just let the adjuster know they have an attorney that they must call. At Hudson Law Firm, we always first evaluate the type of case and facts of the case to determine if a statement should be provided and, if so, we are always present with our clients during the recorded statement. Afterwards, we will attain a copy of the statement transcript. 3 Mistake #3 Guessing at facts in a statement. If you decide to give a statement, be careful about admitting or volunteering facts in a recorded statement that may work against your claim. Always answer just the question asked, preferably with just a yes or no, so you do not give the adjuster any extra ammunition to use against your claim. Do not worry about seeming rude or short in your answers. A statement should not be treated like a conversation with a new friend. Also, if you do not truly know the answer to a question, never guess or speculate. It is far better to state that you do not recall or you do not know because it happened so fast than to guess or make up unknown facts. What you say about the facts, even if you are guessing, will be taken by the adjuster as true and likely will damage your injury claim. Conversely, with slip and fall and other types of injuries not caused by an automobile accident, what you state that you do not know will damage or negate these types of claims altogether. If we decide our client needs to provide a statement, we always prepare our clients for the types of questions to be asked and we are always present during the statement to make any necessary objections. Mistake #4 Not seeing a doctor. If you do not see a doctor, the adjuster will conclude that you are not hurt. It is rare that an insurance adjuster will pay much, if anything, for your pain and suffering if you have not been treated by a doctor. Even if you do not feel any pain immediately, are only feeling slight pain, or only have a few scratches or bruises, please make sure you get examined by a doctor to make sure you do not have more going on than you think. This is especially true if you have health insurance. The cost of the medical visit will be part of your personal injury claim anyway. We would also like to point out that if the pain in your neck, back, or other muscles does not subside within two weeks from the accident date, it is likely that you do have more severe injuries (not just soft tissue injuries) that are causing your pain and that will likely only get worse with age. Be especially careful with any pain that shoots down your extremities or if you have any burning or numbness feelings in your extremities, hips, or fingertips, as these are the main indicators that you may have a serious problem. If you do not have health insurance or money to pay for medical treatment, then you should consult with a personal injury attorney that may be able to help you find a way to get the treatment you need. We have helped many clients with no money or no health insurance to get the medical treatment they need. 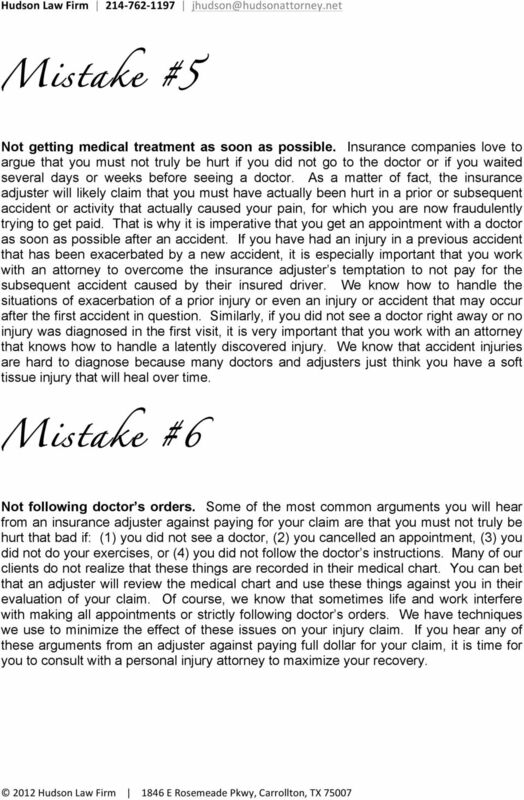 4 Mistake #5 Not getting medical treatment as soon as possible. Insurance companies love to argue that you must not truly be hurt if you did not go to the doctor or if you waited several days or weeks before seeing a doctor. As a matter of fact, the insurance adjuster will likely claim that you must have actually been hurt in a prior or subsequent accident or activity that actually caused your pain, for which you are now fraudulently trying to get paid. That is why it is imperative that you get an appointment with a doctor as soon as possible after an accident. If you have had an injury in a previous accident that has been exacerbated by a new accident, it is especially important that you work with an attorney to overcome the insurance adjuster s temptation to not pay for the subsequent accident caused by their insured driver. We know how to handle the situations of exacerbation of a prior injury or even an injury or accident that may occur after the first accident in question. Similarly, if you did not see a doctor right away or no injury was diagnosed in the first visit, it is very important that you work with an attorney that knows how to handle a latently discovered injury. We know that accident injuries are hard to diagnose because many doctors and adjusters just think you have a soft tissue injury that will heal over time. Mistake #6 Not following doctor s orders. 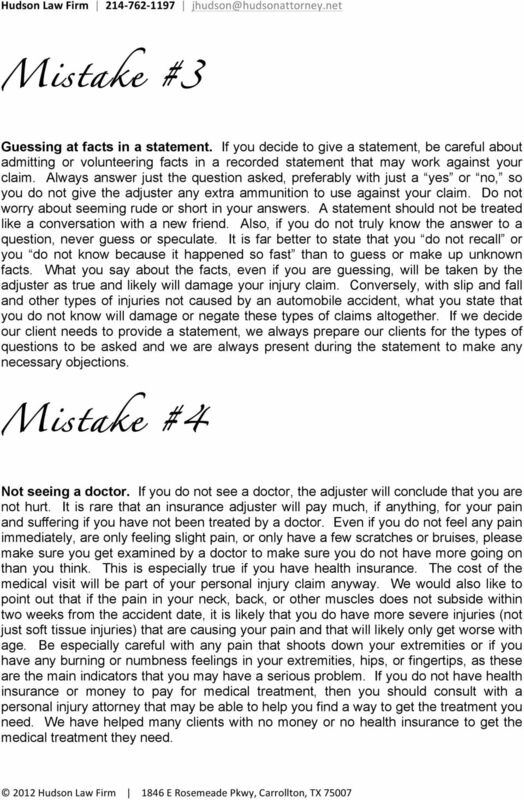 Some of the most common arguments you will hear from an insurance adjuster against paying for your claim are that you must not truly be hurt that bad if: (1) you did not see a doctor, (2) you cancelled an appointment, (3) you did not do your exercises, or (4) you did not follow the doctor s instructions. Many of our clients do not realize that these things are recorded in their medical chart. You can bet that an adjuster will review the medical chart and use these things against you in their evaluation of your claim. Of course, we know that sometimes life and work interfere with making all appointments or strictly following doctor s orders. We have techniques we use to minimize the effect of these issues on your injury claim. If you hear any of these arguments from an adjuster against paying full dollar for your claim, it is time for you to consult with a personal injury attorney to maximize your recovery. 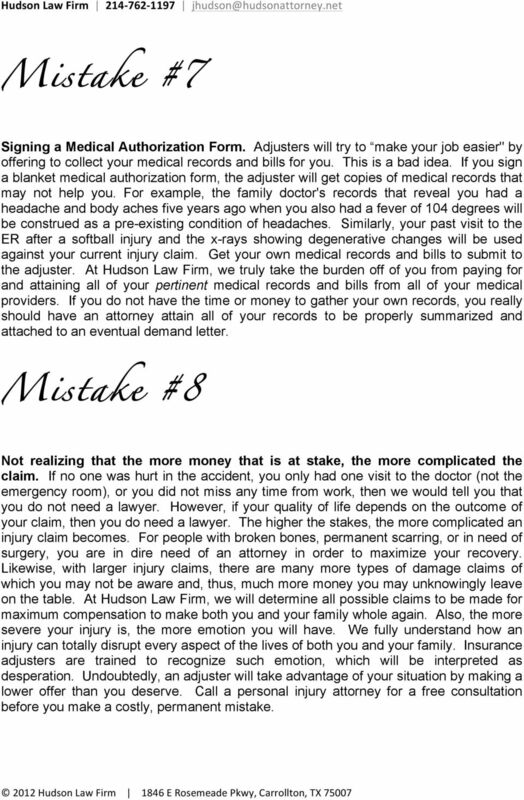 5 Mistake #7 Signing a Medical Authorization Form. Adjusters will try to make your job easier" by offering to collect your medical records and bills for you. This is a bad idea. If you sign a blanket medical authorization form, the adjuster will get copies of medical records that may not help you. For example, the family doctor's records that reveal you had a headache and body aches five years ago when you also had a fever of 104 degrees will be construed as a pre-existing condition of headaches. Similarly, your past visit to the ER after a softball injury and the x-rays showing degenerative changes will be used against your current injury claim. Get your own medical records and bills to submit to the adjuster. 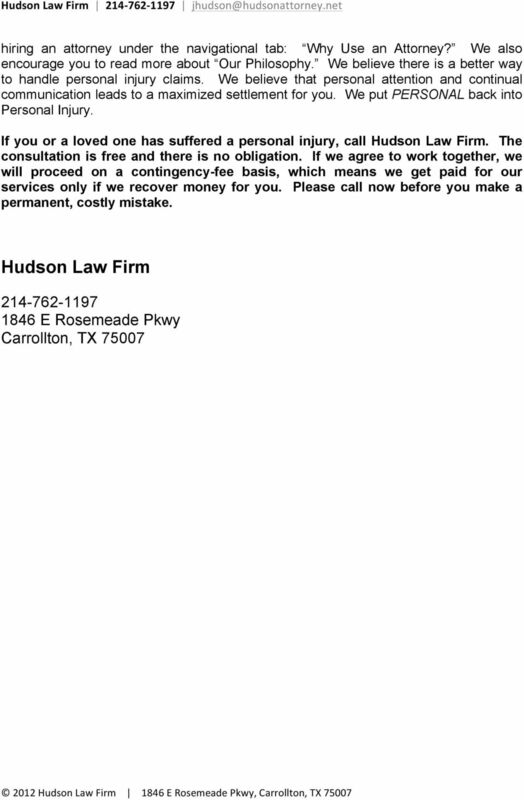 At Hudson Law Firm, we truly take the burden off of you from paying for and attaining all of your pertinent medical records and bills from all of your medical providers. If you do not have the time or money to gather your own records, you really should have an attorney attain all of your records to be properly summarized and attached to an eventual demand letter. 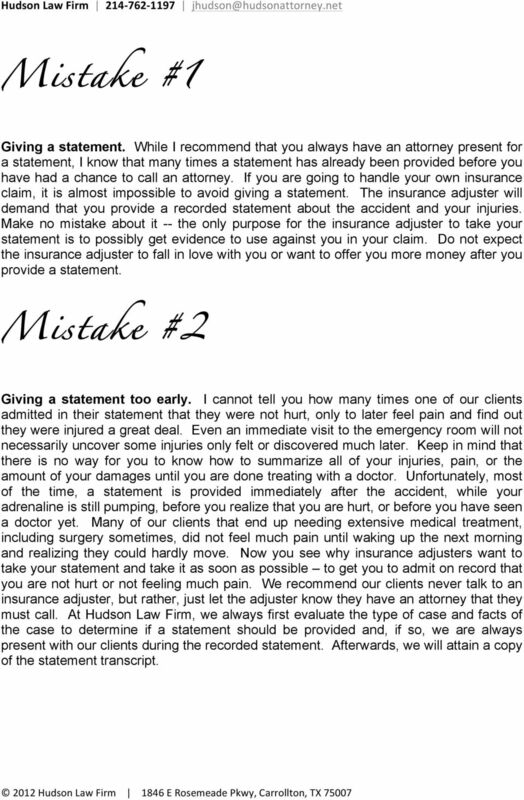 Mistake #8 Not realizing that the more money that is at stake, the more complicated the claim. If no one was hurt in the accident, you only had one visit to the doctor (not the emergency room), or you did not miss any time from work, then we would tell you that you do not need a lawyer. However, if your quality of life depends on the outcome of your claim, then you do need a lawyer. The higher the stakes, the more complicated an injury claim becomes. For people with broken bones, permanent scarring, or in need of surgery, you are in dire need of an attorney in order to maximize your recovery. Likewise, with larger injury claims, there are many more types of damage claims of which you may not be aware and, thus, much more money you may unknowingly leave on the table. At Hudson Law Firm, we will determine all possible claims to be made for maximum compensation to make both you and your family whole again. Also, the more severe your injury is, the more emotion you will have. We fully understand how an injury can totally disrupt every aspect of the lives of both you and your family. Insurance adjusters are trained to recognize such emotion, which will be interpreted as desperation. Undoubtedly, an adjuster will take advantage of your situation by making a lower offer than you deserve. Call a personal injury attorney for a free consultation before you make a costly, permanent mistake. SHOULD MOTORCYCLISTS USE GO PRO CAMERAS ON THEIR HELMETS TO HELP PRESERVE EVIDENCE IN THE EVENT OF AN ACCIDENT? WHEN IT COMES TO. Personal Injury Law, LEARN. UNDERSTAND. ACT. Website Copy. Injured? Get an Expert Personal Injury Solicitor and Only Pay if You Win!